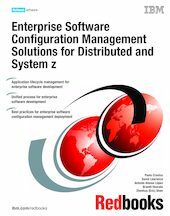 In this IBM® Redbooks® publication, we describe how you can implement an application lifecycle management solution with Rational® Developer for System z® , Rational ClearQuest® , Rational ClearCase® with the z/OS® extensions, and Rational Build Forge® . Our target audience includes java and COBOL developers, architects, team leads, and release and production management staff who are responsible for managing the life cycle of cross-platform or enterprise-wide applications that are composed of host z/OS and distributed components. In this book, we present an approach that we call Enterprise Software Configuration Management (ESCM) and discuss the problems with releasing cross-platform applications in a secure, robust, and reversible manner. In chapter 1, we explain the rationale for producing this book and present a few case studies. In chapter 2, we describe the challenges that we observed in many IT enterprises as they struggle to integrate the distributed and mainframe sides of the house. We also discuss both the costs and benefits of implementing an ESCM process and the risk of not doing so. In chapter 3, we describe the idealized ESCM model, specifically, what a successful ESCM looks like from an organizational and functional perspective (as opposed to from a technical perspective). We present some suggested (and effective) best practices. In chapter 4, we present a detailed implementation with several alternative strategies that we use in this book in the context of an overall ESCM life cycle, where Rational Developer for System z is positioned as the primary developer interface. We show how we implemented Rational ClearCase with the z/OS extensions to run native z/OS builds and describe how we use the integrations between Rational Developer for System z, Rational ClearQuest, Rational Build Forge, and their associated integrations to implement an end-to-end ESCM life cycle. In chapter 5, we discuss what to consider as you begin the implementation of an ESCM solution and prepare you to structure your teams, assign responsibilities, and plan for general tasks and activities. Chapter 1. Why this book?